Believe it or not, I am a huge food lover. Foodie. Food dork. Call me whatever you will, but food shapes my life. I look forward to seasons like I look forward to vacations; seasons are burned into my mental calendar. I know that like any good papa bear, I am supposed to love all of my cubs the same. And I do love the flavors of all the seasons, but July is my absolute favorite. No disputing that and no apologies. So why July? What makes this month so special? When I break it down, July is so special because it highlights fruits that literally have a 2 week season. July’s headliners are so fast that if you blink, you will miss them. Not only that, they are incredible flavors. These fruit offerings have been basking on trees, bushes and vines for over three months. They have soaked up all of the sun’s energy and turned those rays into intense flavors that is hard to get any other time of the year. 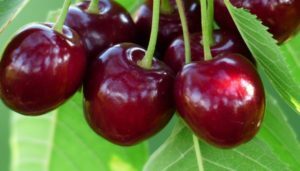 Cherries, nectarines, melons, berries, and figs will all bring a huge smile to your face this month. Enjoy them with abandon because this is their time to shine. That brings me to the Summer Conundrum that we face every year with local produce. And that is when local produce is at its peak, peoples’ lives are at their craziest and we don’t eat at home that much. Grocery stores see a dip in sales over the summer and restaurant sales go up. When people are busy, routines go out the window and we end up eating stuff on the fly. I get it and my house is no exception. Summer is hectic. But if you can silence your mind from the chaos that we call summer, remember that the summer months are the Best months to be eating locally and enjoying flavors that we will not see for the next 10 months. These summer months are our time to shine. Our time to taste foods at their peak and to try varieties that grocery stores would never dare to carry. Stores have to worry about shelf life and is the food visual appealing enough that someone will buy it. Because we get our produce to you so quickly, we can concentrate on flavors and not shelf life. So we find the best varieties, keep them on the vine until they are ready, harvest them and then sprint them to your door. A question like that speaks volumes about the philosophy behind the grower. a) Paul wants the cherries to be as fresh as possible. So he will harvest them the day before we get them. b) Paul knows (after 12 years of dealing with us) that his cherries will find a home and be from his orchard to your kitchen in a matter of days. c) finally, when you have a partnership like that, you can ripen the cherries to a higher sugar content and still not lose them due to spoilage. Here is a little known fact in the produce world so turn up your volumes for a second. When you take a fruit off the plant, sugar production (aka ripening) stops. People say they let a fruit ripen on their counter and honestly that is kind of misleading. 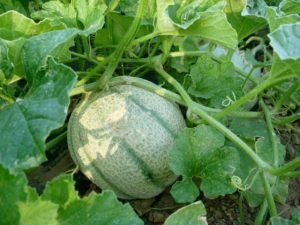 Sitting on your counter the starches of a melon (for example) will start to break down and be softer to chew on, but the sugar content of the melon will be the same as the moment it was harvested from the plant. Stay with me here…so Sugars breakdown quicker than Starches (that’s why potatoes can store for months). And so if you are worried about shelf life, you harvest honey dew that tastes like a potato. 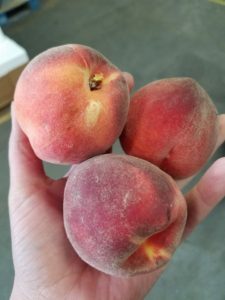 But if you are harvesting for flavor/sugars, you let that fruit sit on the tree as long as you can so that sugar levels go up and starches breakdown on the tree and not in your kitchen. It is in this patient waiting time that makes the difference between a piece of fruit that tastes like a potato and one that tastes like nothing you have ever tasted. When a grower can disregard “shelf life” and focus on flavor, you get to experience what I like to call Transcendent Flavors. A flavor so rich and incredible that it will stop you in your tracks and leave you asking how the heck a simple fruit can have such amazing flavors. These are the flavors that I am in search of throughout my life. And seeing as how my mom taught me to share at a young age (with 3 brothers), I love bringing these flavors to you and your familia. Enjoy! 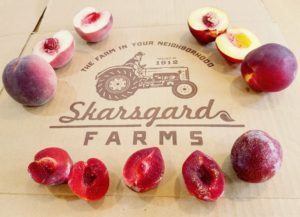 Items to look for this week…Peaches, Plums, Asparagus, Berries, Grapes, and much more. One thing that I have seen over and over in the marketplace is that nothing ever stays the same. Not so long ago, Blockbuster Video had an entire College Football Bowl game named after them, fast forward 10 years and kids these days will never step foot in a video store their entire lives. Businesses have to be thinking about what is coming around the bend or they will end up a speed bump to the speeding semi truck that we call Progress. Demands change, lives change, and so businesses have to change in order to be relevant as calendar pages turn. And I have to tell you that a year ago when Amazon bought Whole Foods I felt a major shock-wave go through the small farm movement that I had been a part of for over 15 years. I knew at the time and still firmly believe today that after the buyout of Whole Foods, our Organic food industry was in for a wild ride. And it has not disappointed. The last year has seen some of the most challenging times food providers have seen in probably 50 years. So I have spent very little time over this last year reminiscing about the past. It has been a daily puzzle to think about where the movement is going and where the heck are the opportunities in this changing market? How does a small group of producers play the game in a world of giants? What is our competitive advantage that has not only brought us 15 years into this movement but will also propel us for the next decade and beyond. I have never liked/wanted to chase the “fad” of the Buy Local buttons and bumper stickers. For me this small farm movement goes a lot deeper than a sticker. So this daily grind to bring a better food landscape to our neighbors and families cannot be willy-nilly or random. We have to be laser focused on the mission. So I want to plant this seed with you today and share with you the vision of where we will be heading moving forward. And just as you would begin any journey, we have to start with a goal in mind and then work backwards from there. We cannot launch our road-trip without even knowing where in the world we are going. So with that, there is a notion that I feel keeps coming back to my future vision of our food landscape and that is Experience. You see if we view the world like Amazon, everything comes down to price and convenience. That is great and that marketing pitch speaks to a lot of people in this country. But you know what, Convenience is freaking uninspiring and boring. So the idea is that if we have this incredible force of Convenience/Prices in our marketplace, there must be the counterpoint. So what is the antithesis to Convenient anonymity? Yup, you guessed it, Experience. 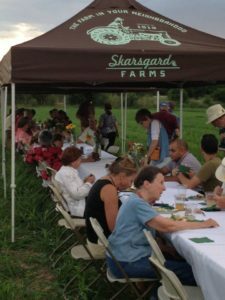 So the next chapter for Skarsgard Farms in our community will be a mission rooted in Experience. Then a hand pops up in the front row, “But Farmer M., dude, how do you cultivate an Experience for people through home delivery?” Great question Ted (Ted is my go-to fictitious name for the over-achieving student who sits in the front row btw). The short answer is that we cannot fully incorporate an experiential shopping/learning opportunity through the home delivery service by itself. We need more. We need better. And that is why we are moving. Moving? Yes moving. We have an absolutely incredible opportunity to launch the next phase of our mission. The new space (and I am going to hold you in suspense for a bit before we tell you all about it) will be our new headquarters not only for the home delivery, but also for a retail market concept that we have been brainstorming and designing. It will be home for cooking classes, plant sales, gardening classes, wine/cider/beer tastings, farmers’ market, local baked goods, meats from our ranchers, fresh coffee, chile roasting, juices and a slew of other items that we are putting together. Basically a year-round hub to highlight all of the amazing flavors that our state does so well. This place will be our final exam that we have been building on for the last 15 years. So believe it or not, we are steaming into June. I don’t know about you, but the this year feels like it is flying by for me. But before we get off on a tangent about years, calendars and the meaning of life, let’s keep it simple and talk food. For me, June is The pivot point for food production throughout the year. Each month has news faces coming and going from the seasonal food table. Seats at this table can change quickly or linger, but for me, June marks a major shift of how we eat for the next few months. And I honestly could not be happier that we are standing on the door step of such a wonderful time of the year for fun and flavorful eats. So what the heck happens in June to make it so unique? Well, first off we will see the weather get too warm (ok dang hot) for many local greens. Spinach, arugula, lettuce, chard and kale absolutely hate hot days. They prefer the 70s (like my parents) and call it quits when temps get into the 90s. The sweet greens that we enjoy during the spring turn bitter and the flavor feels like you have been punched in the mouth. Therefore, after June 21st the local greens will have to come from a regional producer this summer for your salads. 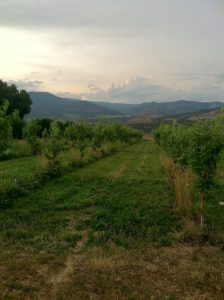 But to help ease the hurt of losing our local greens, we have Paul and his 85 acres of Excelsior Orchards in Paonia, CO. We have been working with Paul since 2005 and he is undoubtedly our strongest partner. In 2014 with no lawyers around and with two cups of coffee in hand, Paul and I agreed to buy all of his fruit for that year. He could focus on his trees and we would find happy homes/mouths for the fruits of his labor. That year, we had Excelsior fruit in our CSA boxes for 26 straight weeks. And fortunately for all of us, we have not changed that agreement since then. 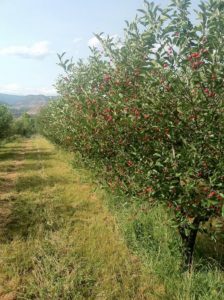 Cherries, tart cherries, plums, peaches, nectarines, pluots, pears and apples all call his orchard home. Well those and a ton of wildlife, farmers, and some big guard dogs to keep the bears from eating the fruit before we can. We will highlight Excelsior and Paul more coming up this summer, but for now, just know that you are in for a treat this summer. And if you have been with us in previous years and are not new to the rodeo, well you know how special his fruit really is. 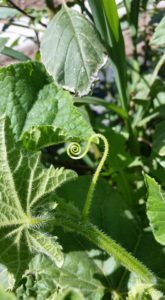 June will also see the continuation of melons, tomatoes, cukes, and summer zucchini. Varieties will change as we roll through the summer, but look forward to those being good staples for your summer eating. 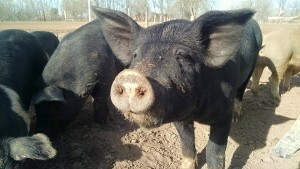 Pork, we have harvested 7 more pasture raised pigs to keep up with your demand as the summer grilling season is upon us. Bratwurst links and ground chorizo have joined the awesome team of Breakfast, Italian, and Green Chile sausages. All of these animals were born and raised on pasture and have never seen a concrete pad in their lives. Not many animals can say the same. You can definitely taste the difference in the meat. Quick tangent on meats for you and for this one I will take you back to elementary school when Mrs. Kitts was telling you that “you are what you eat.” As it turns out she was right. You see as animals eat a higher percentage of their diet in pasture, they have a higher percentage of Omega-3 fats rather than the dreaded saturated fats. This happens because there are no saturated fats in grasses, so the animal cannot inherently produce a type of fat that is not in their diet. When animals are raised on high fat diets like corn/soy, their meat has less Omega-3 fats and more saturated fats. Basically then, what the animal eats determines how healthy the meat will be that you eat. Taking that a step further, what the rancher feeds the animal will let you know how healthy the meat will be for you and your familia. 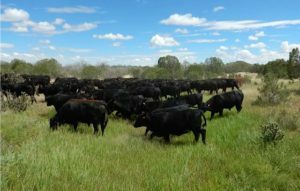 And it is because of this “You are what you eat” principle why we only work with the most conscientious ranchers who understand that whatever we do to the animals, we do to ourselves. And whatever we do to this earth, we are doing to ourselves. This belief in causality drives all of the food choices that we offer to you. Not all of our members choose to eat meats and I totally 100% respect that. But if you are going to eat meats, there are no better stewards than the ranchers that we bring to your table. We are fortunate to have such thoughtful and skilled ranchers so close to our home. Enjoy!